As with many facets of our lives, the availability of promising new technologies is profoundly transforming records management. This transformation is ongoing; many organizations are still using tried-and-true paper-based records management methods. But the shortcomings of this approach are becoming increasingly problematic for both compliance and organizational efficiency. Paper-based processes are highly manual and hugely time-consuming when the need arises to perform a legal discovery exercise or respond to a freedom of information request. Furthermore, without metadata tagged to your records, you cannot guarantee that you’ve found all the pertinent files. So now you’re looking for a better way, and there are obvious benefits to transitioning to SharePoint-based electronic records management. A digital approach promises automation of record capture and classification, radically faster searches, and rich meta-tagging to greatly increase the discoverability of records. With email usage continuing to grow, electronic capture of these records also makes far more sense than printing out hard copies to be stored in a box. And, when records and record capture are electronic, you can use computing power to track creation and access, giving you much better visibility for compliance purposes. Your firm, like 85% of the Fortune 500, has SharePoint or is deploying it, and it’s probably underutilized. IT has already blessed the tool, and is already paying for it. So there’s an opportunity to take advantage of an existing investment, with multiple benefits across the organization. However, for many record managers or knowledge managers, the idea of championing such a wide-reaching organizational change effort is daunting, and it can be hard to know where to begin. Here are three questions to consider to help you in your planning. Question 1: How will our electronic records classification work? First of all, implementing an electronic records management classification methodology is a complex undertaking and we definitely recommend getting help from someone who’s done it before. You will certainly need internal tech resources or consultants who can help with implementation. Also be aware that you may need third party help depending on the complexity of the file plan, which is a key deliverable you’ll need to create to implement electronic record classification. Your file plan includes classification for schedule and retention policies—it is basically the equivalent of a schedule you’ll have used for paper records. As with a paper records schedule, a file plan is usually based on guidance contained in governance document (from a governing body) that describes record types and retention. For example it will identify a functional area (like finance and accounting) and then under that list all the record types (like invoices or purchase orders) and describe how long they need to be kept. Someone needs to interpret the law and put your plan into a tabular format. Some companies will sell you pre-made file plans by vertical or industry. Usually your Record Manager is the expert on retention policies, which don’t change when moving from paper to electronic. What an external consultant can help with in the transition is to find common denominators between different policies and simplify it. For example, if all contracts need to be kept for seven years regardless of which type, then you can create one classification called Contract and associate it with a seven-year retention policy. If they want to do further metadata tagging for each type of contract, they can create classifications that inherit properties from the main one and associate each of them with different metadata columns—without having to create a retention policy for each type. There’s a human element at play in record classification as well. People need to be trained on specific policies and procedures, like: what qualifies as an email record and how to classify records when capturing them. From a change management perspective, you need to consider how will you implement the processes needed to file and retrieve records in your own organization. You need to make records management as seamless and consistent as possible. Filing a record is never a high priority for users. So the trick is to make it effortless and almost invisible to get compliance. There are a couple of approaches. One option is to map your records to a library structure. People don’t think about policies and how long it needs to be saved, rather, they think about file types and folder types. In this approach the information architecture in SharePoint is key. 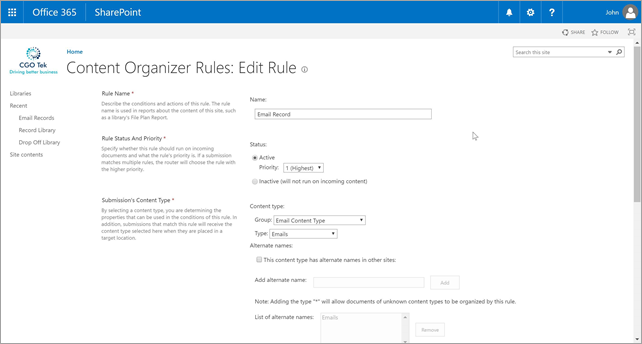 You’re trying to make the site hierarchy within SharePoint easy and intuitive to navigate and use, so that people can intuitively know where to save any specific record. Alternatively, you can use something like the built-in SharePoint Drop Off Library and Content Organizer which use an approach called rule-based classification. In this scenario users simply put every electronic record into a drop off library, and depending on the metadata it will automatically move the content to the right place automatically in the background and apply a rule for retention policies. Working with Content Organizer can be complex, so we recommend asking your consultant to help you navigate this. Question 2: What happens to our existing records? If you’re using a paper-based system today, should you plan to convert your existing paper records to an electronic format? It is possible: OCR software and scanners give you the tools to do this. Then for every document you scan you can attach metadata and upload it to SharePoint directly. But be aware that converting paper records to an electronic format is a hugely laborious task—companies who tackle it usually hire co-ops to do this over the summer because of all the rote work involved. It may not be worth the effort. If your paper records are going to be destroyed in seven years anyway, when their retention period expires, then you might decide to just stick with them. Most companies draw a line in the sand and say: “up to this date we maintained physical records and going forward we’ll be electronic.” However, bear in mind that you’ll still need to set up ongoing transfers of paper to electronic formats for some record types. One example of this is taking a physical document with a signature—like a contract—scanning it, and then storing it as an electronic, meta-tagged record. “But wait,” you say. “I thought the idea was to get away from paper entirely.” For the most part that’s true, but while you can make almost everything electronic, there will always be a need to maintain some physical records for legal reasons. An example of this is land titles, which by law (depending on which jurisdiction you are in) need to be paper-based. So you still need to be able to handle some paper records. The process is fairly straightforward: you print labels for your physical records and then create a “pointer” record in SharePoint. The pointer record tells you exactly where the file is (e.g. File room A, box 11, shelf 4). 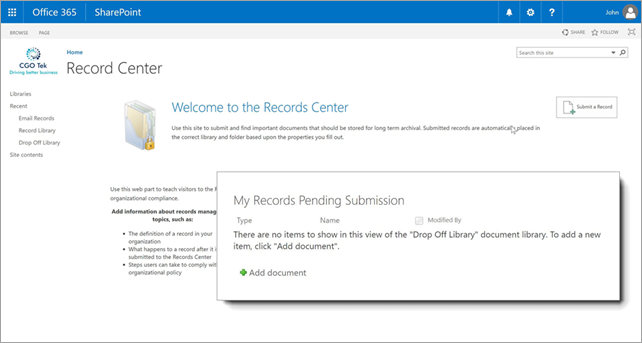 This hybrid approach lets you search for these mandated physical documents in SharePoint, just like all your digital records. Another situation that arises is having some subset of your records already in a non-SharePoint digital repository that you’re trying to move away from. Matching records 1:1 can be difficult whrn trying to do a migration; thus a lot of people try to run their systems in parallel. Many organizations end up building a layer on top of SharePoint that also enables them to go and search the other repository. The record lifecycle continues on the older platform until such a time that they no longer need to retain the records in it and it can be turned off. The downside here is that, if not implemented correctly, having records in two different systems can be confusing for users which can undermine your efforts to get everyone on board. Some organizations do try to migrate their electronic records because of the cost of maintaining two systems. Or, if the legacy system is unsupported or no longer maintainable you may need to migrate your records. Question 3: What does a realistic rollout schedule look like? It takes planning, execution, follow-up and a lot of time to move an organization from physical paper to electronic records management. Deciding whether to do all departments at once, or one at a time is ultimately up to you, and the answer will be largely driven by the size of your organization. But a single big push into multiple departments can be difficult and introduces unnecessary scope and risk to your project. Instead, considering splitting your rollout into phases. Going department by department mitigates risk and gives you the opportunity to get some early wins with receptive departments that you can leverage when tackling ones with higher resistance to change. A phased approach also allows you to grow and mature the file plan in a way that makes sense. Building a file plan for the whole company at the beginning of your project is a massive task, and requires extensive and broad consultation. By building your file plan in smaller chunks you make the task more manageable for you and your colleagues, allowing your team to learn as you go. When considering where to begin, good early candidates include departments that will benefit the most from electronic records management, typically: finance, legal, human resources, and sometimes procurement. These departments generally already have workflows and compliance needs that encompass a significant amount of record management, so they are more likely to see the upside to making a switch and embrace the change you’re trying to implement. You’ll get more push back from lines of business, so start where you can get real traction to demonstrate the value in what you’re working to achieve. Regardless of where you start, you’re going to need to get stakeholders from specific key groups engaged, namely: legal, IT, record management (if you’re not in that group yourself), and the end user department. These key stakeholder groups will need to be involved on an ongoing basis, especially up front. Each player will have a different role to play at a different phase. The legal team will inform you of eDiscovery requirements. Record management can provide input on how to classify records and assist in building the file plan. IT will likely play a role in implementing the technology, and as the owners of your SharePoint deployment they will be central to the strategy. Great projects capture goals and success criteria up front, so devote some time early on with your team to define what you’re trying to achieve and the metrics you’ll monitor to know if you’re achieving it. Is your percentage of correctly-classified records rising? Is it getting easier and faster to retrieve content? You’ll need to capture baselines if you don’t know these numbers already. Go in with the mindset that you need to establish ongoing monitoring capabilities allowing you to notice trends and drive process compliance to 100%. 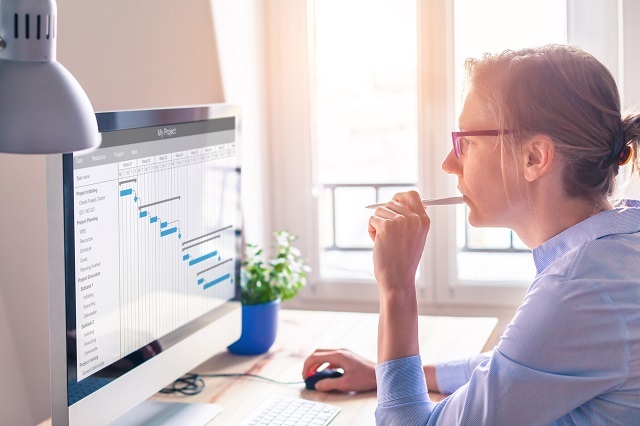 Training during a departmental roll out is part of change management, but achieving full compliance requires ongoing visibility to your process-level metrics. You may want to check out our guide for digital workplace heroes. You may want to read a few short case studies of other companies who have implemented email records management. We’d be happy to talk to you too. Contact us for a free consultation. Easily add metadata and labels as you save emails and files direct to SharePoint from O365 apps.